Elizabeth Manor is a brick, Late Gothic Revival/Collegiate Gothic style, apartment building. Originally, the building contained six units with the basement likely containing common storage and mechanical space. Located in the 1800 block of South Boulder Avenue, the building is situated about a mile south of downtown Tulsa. Constructed in the mid-1925, Elizabeth Manor is located off the east edge of the Buena Vista Park Historic District. With only a small garage/apartment to the north and a multi-story, mid-century Modern, apartment house to the south, Elizabeth Manor fronts onto a park area that remained a grassy area throughout the twentieth century, although two roads now divide what was originally an undivided block in front of the building. 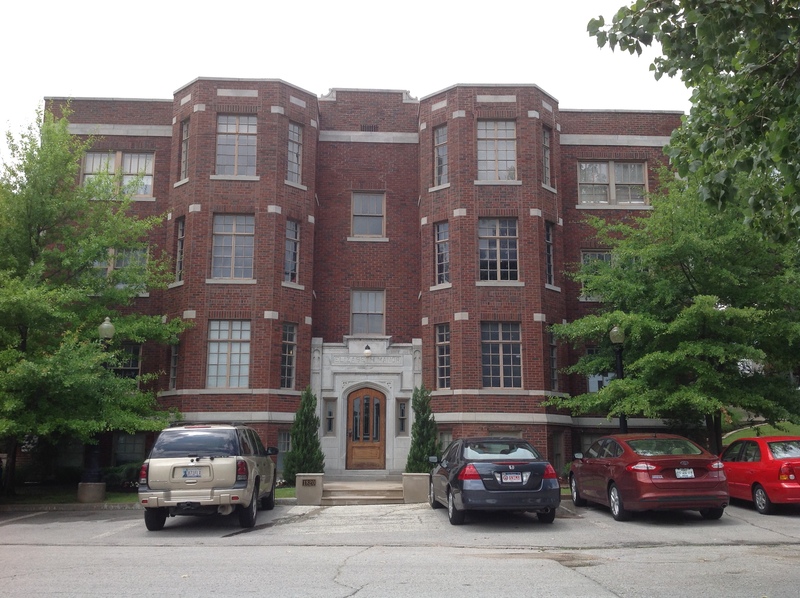 Elizabeth Manor is an excellent representation of the apartment house construction boom in Tulsa during the 1920s. This trend in apartment house construction left a permanent mark on Tulsa’s community development. Increasing more than fourfold in just a decade, the number of apartment houses mushroomed from 78 in 1919 to 333 in 1929. Tulsa’s building boom during this period, including that of apartment houses, was related to the virtual explosion in population which nearly doubled during the 1920s to make Tulsa a major metropolitan area, as well as the thriving economy fueled largely by the booming oil industry. Although some large apartment houses were constructed during the period, many of the apartment buildings, like Elizabeth Manor, contained from four to eight units to allow the size of the building to be relatively modest. Stylistically, the apartment houses employed the popular residential architectural styles of the period. In this way, the apartment buildings such as Elizabeth Manor maintained the scale and cohesiveness of the residential areas, and thus Tulsa, in which they proliferated. Elizabeth Manor was listed in the National Register on June 8, 2015. It was listed under National Register Criterion A, and its NRIS number is 15000329.